Bicycling the small gravel paths through the outskirts and rural regions around Yangshuo, China the prettily flowing fields of flowers set under the towering karst limestone rocks created a post-card perfect landscape. 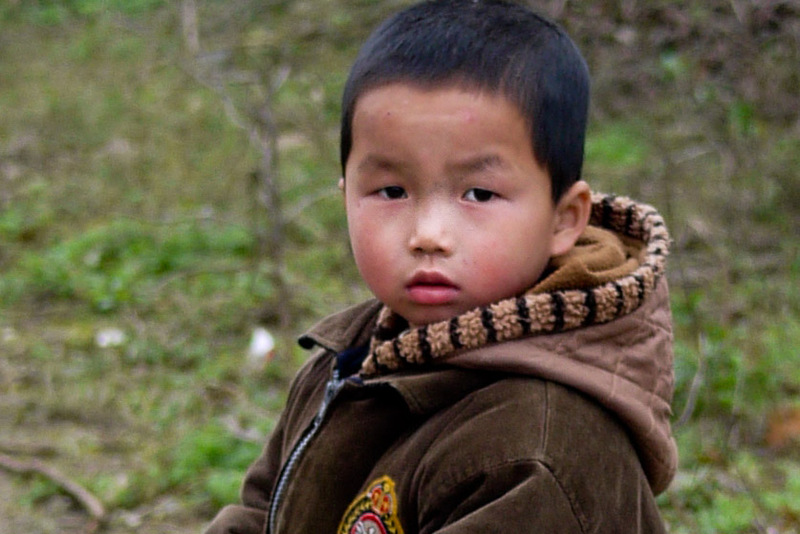 This little boy eyed our trio of foreigners on bikes with clear suspicion as we lazily made our way through the rice paddies near his home. 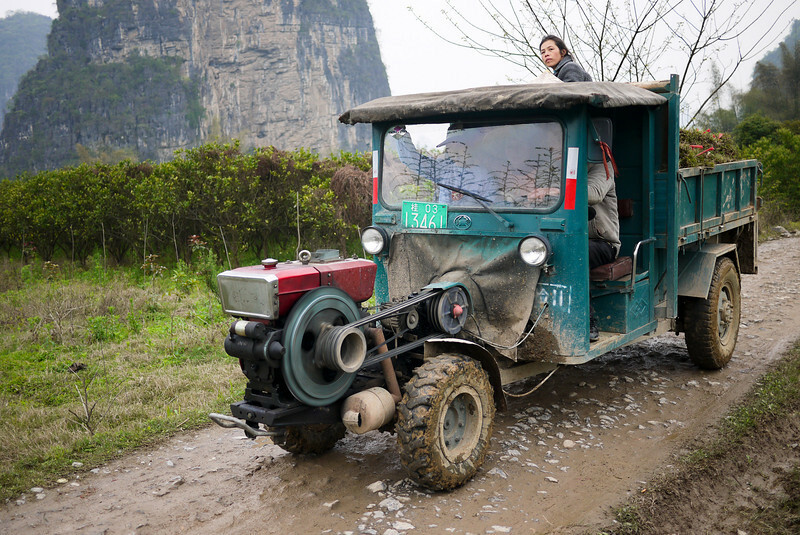 Although our guide asked him some question he remained closed-lipped and cautious until we pedaled by him in the outskirts of Yangshuo, China. Although the full story is saved for another time, these men were highly entertained by our friendly and playful interactions as we bicycled the rice paddies and karst rocks of rural Yangshuo, China. Green fields and long stretches of rice paddies were topped with a wet hazy mist shrouding the karst, limestone rocks on our long bike ride through the rural regions around Yangshuo, China. The most interesting contraption of a truck I’ve yet encountered around the world, these rural farm workers yielded as we biked past with interest and curiosity about such intriguing transportation! Yangshuo, China. 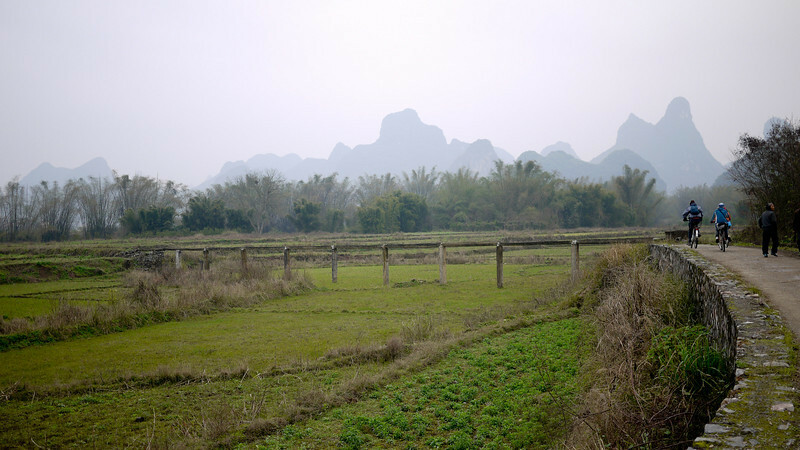 During the off-season for rice production, the rice paddies are filled with blooming flowers to better offset the towering rounded bumps of karst rocks as workers continue working their fields and prepping for the rice planting season in the rural regions outside of Yangshuo, China. 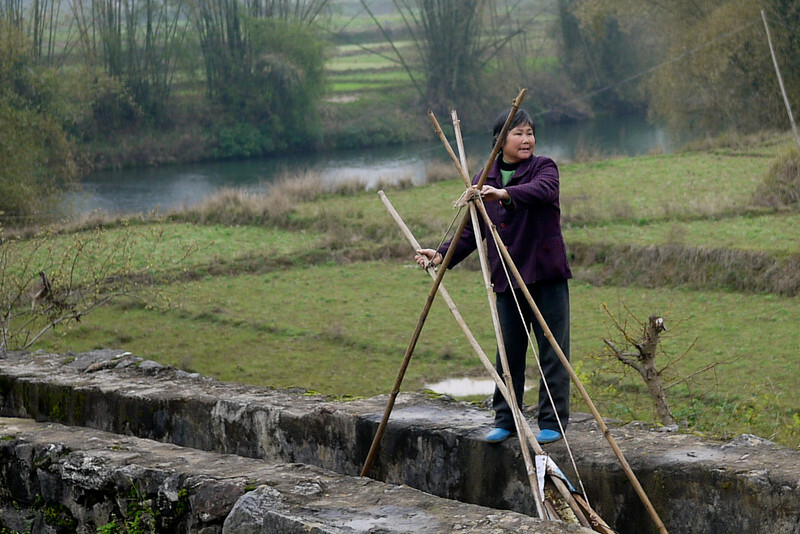 A group of women work together on the other end of this channel to keep the irrigation system intact as water is moved through the stone channel to the surrounding crops and rural rice paddies outside Yangshuo, China. An empty and aging cart sits, unused and decaying, on the quite stone streets of the Xingping Fishing Village that lies on the east bank of the Li River and stands out as a remarkable tiny town filled with Ming and Qing Dynasty structures nearly untouched by time and modern tourism, a rarity in touristy areas of China. 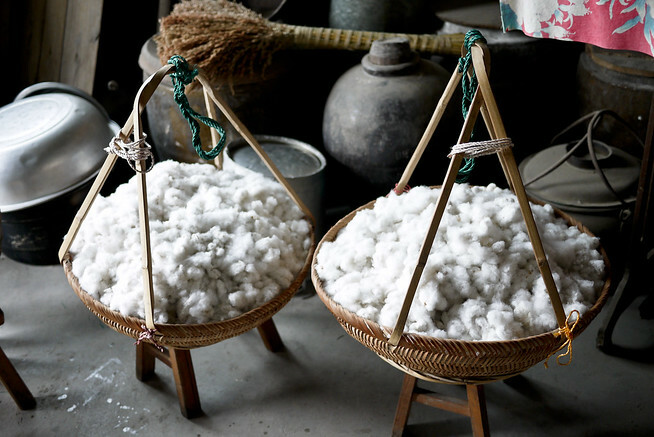 Baskets of cotton sit in the home of a resident of the Xingping Fishing Village, in China. The cotton is already collected and the next step removes the seeds before turning it into any clothes, pillows, and various products. A handmade bowl of vegetarian Chinese dumplings steam and cook in our hostel kitchen after an impromptu cooking class teaches me how to shape and make dumplings. 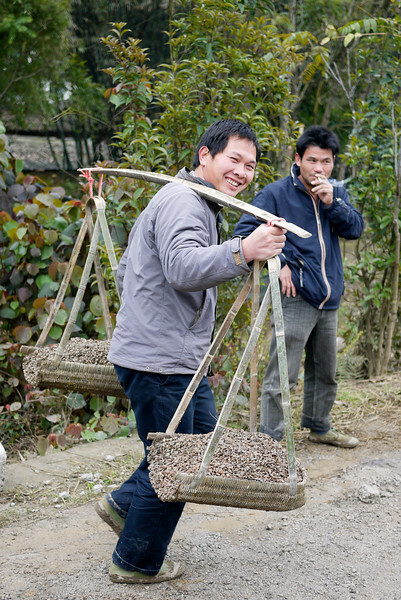 Simple hanging scales are a fast and quick way for the merchants at the weekly Fuli market outside of Yangshuo, China to take care of the bustling business as locals select carrots and other fresh vegetables for purchase. 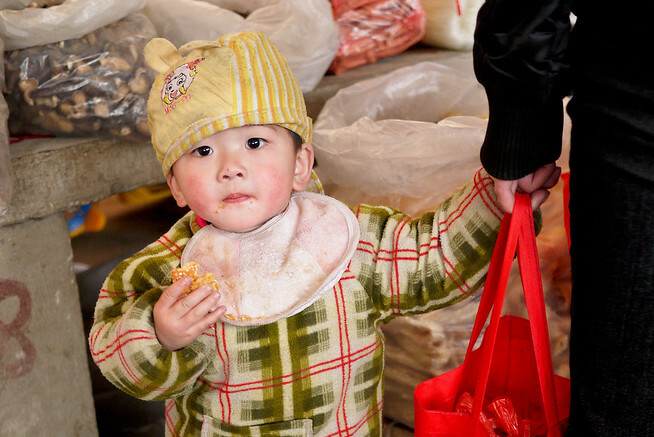 The open curiosity of this little one was a relief from the normal cringes and suspicion of children unaccustomed to sightings of pale-eyed and tall westerners also wandering the streets of the weekly market in Fuli, China. 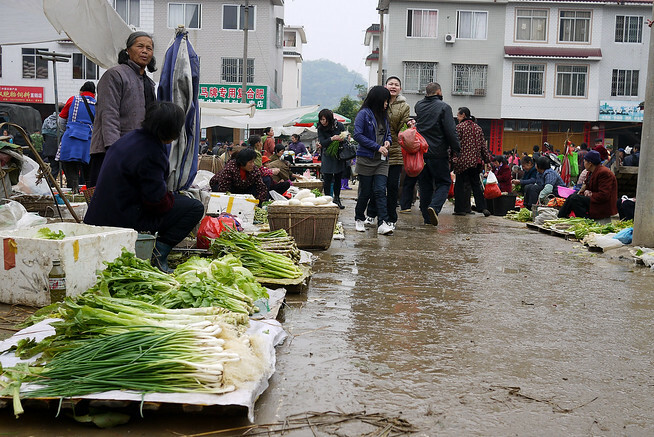 The wet air and light drizzle of rain did nothing to detract the locals from coming out to the weekly Fuli market for their supply of fresh vegetables, fruits, meats, and fish in a town motorbike distance from Yangshuo, China. 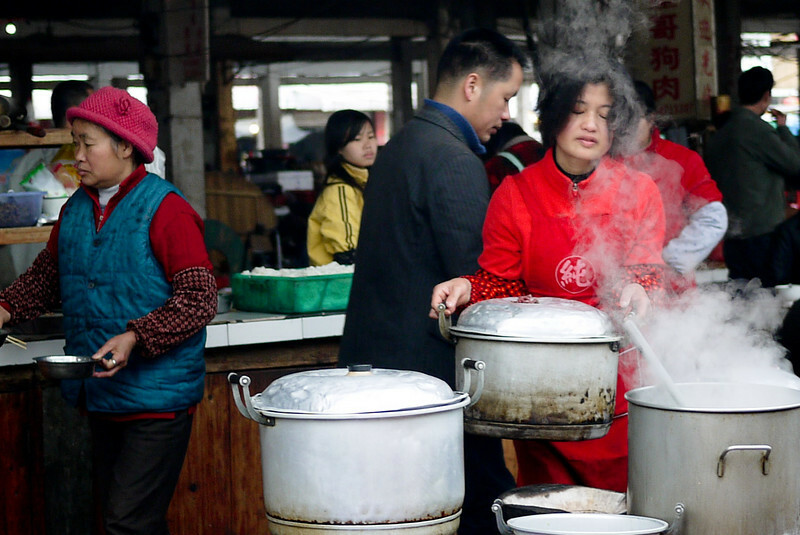 A Chinese woman prepares steaming hot food for the locals and rare tourists to munch on as they wander the narrow aisles of the weekly street market in Fuli, China, shopping for anything from woven field hats to live fish, from squawking chickens to an array of fresh vegetables, beans, candies, and unidentifiable food-stuffs. The pace of life in small rural towns slows down, it’s easier to look at the lines etched on the faces of each street vendor and fill in their life story. The toddler playing close to the the old woman selling vegetables is her grandson, pride and joy emanates from her patient eyes. The end of the day exhaustion haunts the eyes of the farm worker as he tends to his cows and plow. All of these stories are there, present in the rapid pace of the cities, but it’s easier to pass them by and miss the glimpses of a story in each mannerism. 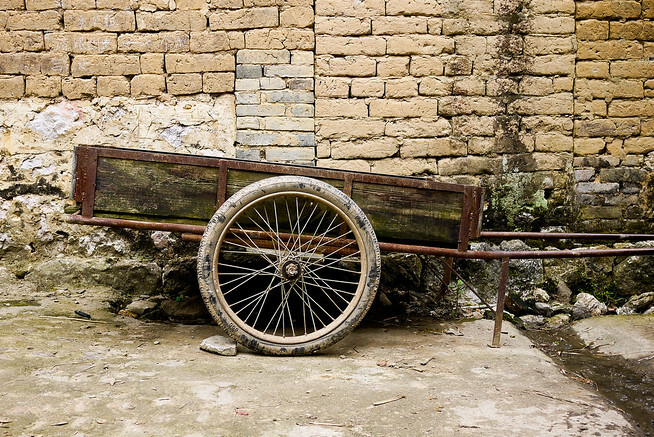 I didn’t spend long in China, particularly not rural China, but the days spent on cycling through the towns and scootering across the bumpy roads around Yangshuo stand out in their stark simplicity. 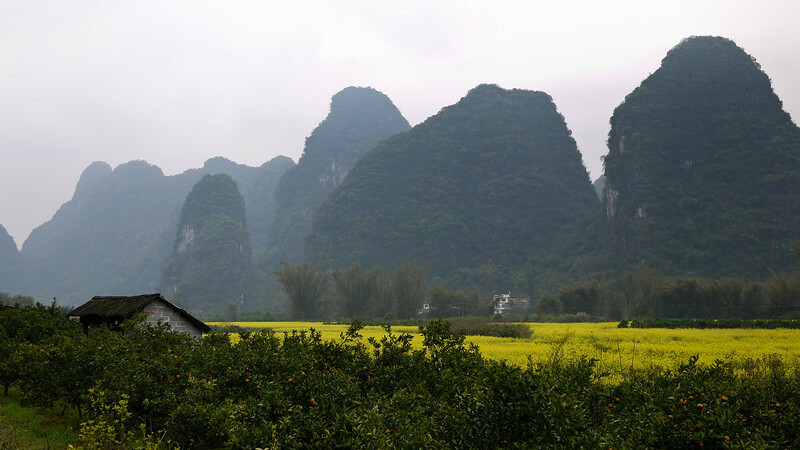 It was wonderful — and you’re right, Yangshuo is very near to Vietnam (on the grand scale of things :) and I imagine they would share some similarities…including really tasty food! Stunning shots. 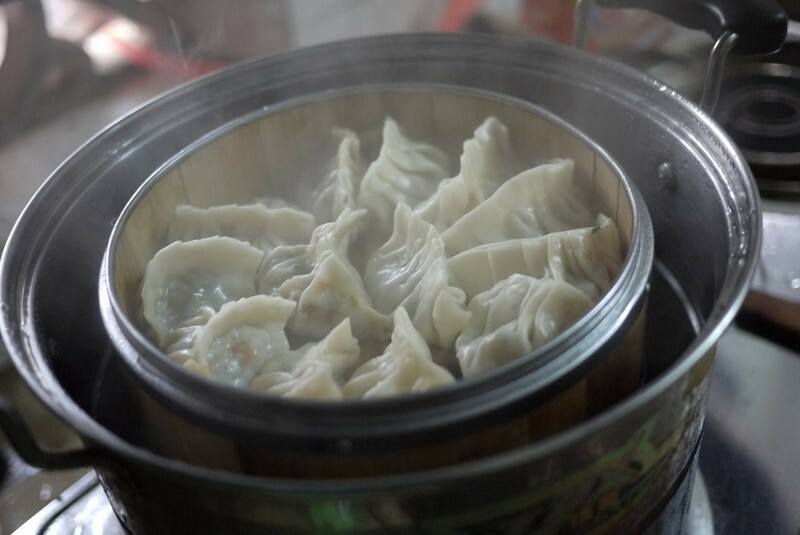 OMG I must have dumplings—NOW! Nice photos. For some reason I particularly liked the carrots. 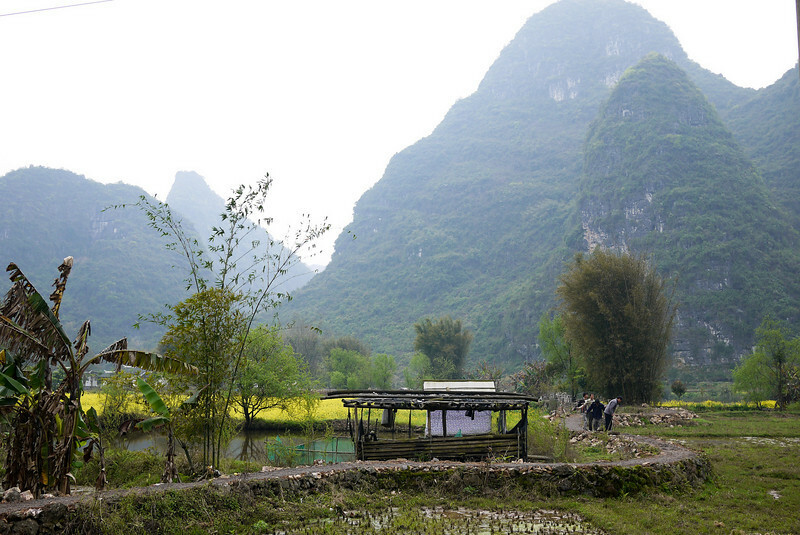 Yangshuo is an incredibly touristy town, but like your photos show, the countryside is just a short bike ride away. I traveled to a number of rural areas across China, but once there it was usually difficult to get around by yourself. This meant hours of walking! Small tourist towns like Yangshuo are great because you can rent a bike, have wi-fi and other conveniences, yet only be minutes away from rural life. Can never go wrong with photos of food in my opinion. The little boy staring was probably my favorite but the vege dumplings look delicious! Those dumplings *were* delicious and you’re right, it’s just always okay to post foodie photos :) Thanks for stopping in Thomas! 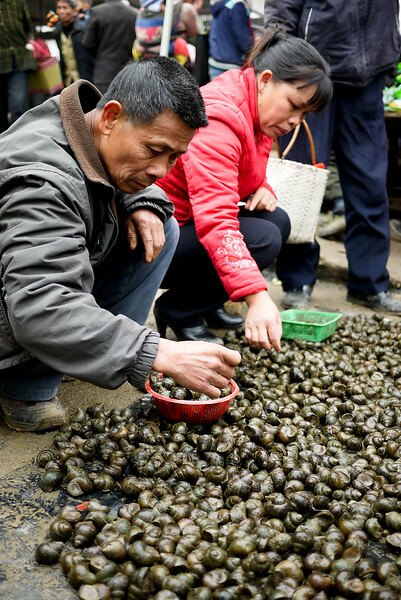 I like the shot of the snail picking though I have never tried snails it is just my favorite one. That and the little boy eating his cookie. I tried snails about 15 years ago and have always regretted it ;-) But yes, it doesn’t make me dislike the photo of them picking through them! Great photos and I loved reading all your captions. I’ve been wanting to go to China but have worried about the language barrier too. Were you able to get by on gestures? Absolutely gorgeous! I have yet to really explore rural China and that pains me, since China is so close to my heart. When you get there Andi you will love it :) Particularly if you feel a connection, it’s so beautiful! Wow. Wow. Wow. I had never thought about China in this way (although now that I see it, I can’t imagine why not). Thank you so much! Beautiful photos! China really surprised me – I was really culture-shocked for the first time in a long time and had a really hard time at first but ultimately I ended up loving it and I really want to go back. It’s such a huge country with so much to see in every corner. Ah, so nice to see little has changed (leastwise in the countryside) since I was there in the early ’90s. Great pics – thanks for the walk-down-memory-lane! Very little? I should think Beijing would be unrecognizable compared to when I was there. But yes, no doubt in the countryside (my favorite) precious little has changed. And yes, as I’m moving to Vietnam soon, I hope to go back and explore more of China. New places though (after all, it’s a HUGE country) for… like you, I fear returning to places I long ago so loved. Oh yes, the cities no doubt are *very* different…in fact, Beijing and Shanghai in particular because they got huge face-lifts for the Olympics and the World Expo respectively. That truck looked crazy…but I guess it gets the job done. Great photos! Great pictures! The vegetarian dumplings look delicious!! Great photos! I especially like the ones at the market. 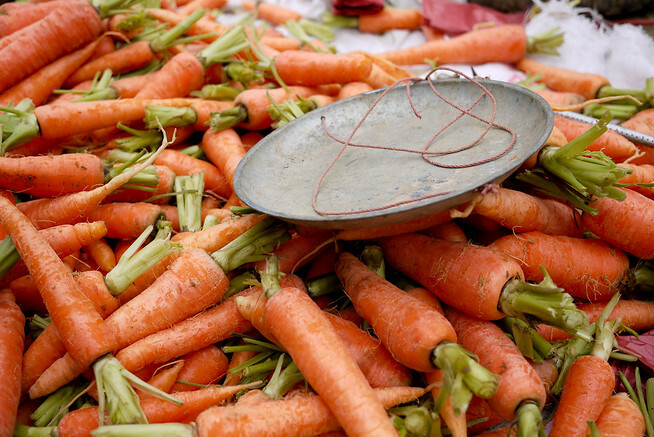 Great photo essay…love it! It really evokes all of the senses and puts the reader/viewer right there with you! Especially love the bags of cotton photo.